A workshop targeted to sophomores and juniors where recruiters discuss the importance of an internship and have a chance to highlight their own internship program. Moderated Q & A. 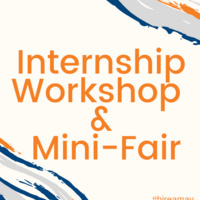 Join us after the workshop for a mini-fair where recruiters discuss open internship positions. For more information, including how to register, please visit uta.joinhandshake.com.